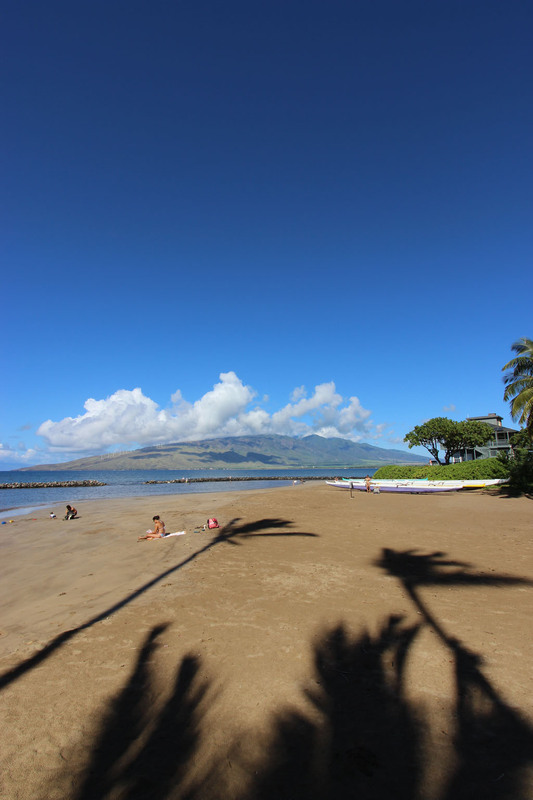 In a nutshell: South Kihei Road passes along scenic shoreline with long beaches. North & South Kihei Road hugs the coastline from Ma’alaea through Kihei. The northern end of these beaches seem to have been heaven-made for launching canoes, walking, running and beachcombing. Wind here is often stronger in the afternoon, so it is great for kite and windsurfing, but laying in the sand during this time can often become a sandblasting experience. Since beach perfection is just a few minutes south, and much of the area is undeveloped, these beaches are often passed over by virtually all visitors. 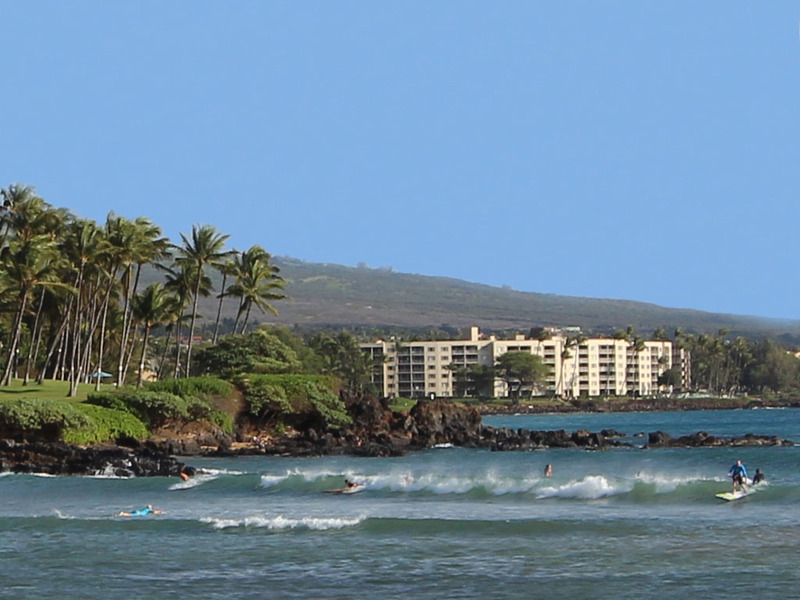 Sugar Beach has become a popular name for the entire stretch of beach including Ma’alaea Beach and an additional mile of continuous beach that ends just north of Kalepolepo Park (below.) With four miles of continuous and well-packed sand, whatever you call it, this is a great beach for long walks and beach runs. This impressive photo of the Kihei Canoe Club, taken by Terrie Eliker was the winner of our first photo contest! The northern 2.5+ miles of Ma’alaea Beach is almost entirely undeveloped, virtually deserted, and you will have it largely to yourself. While it has a lot of reef and tidepools, it is not among the most optimal for laying out and frolicking. Beachcombing, exploring the tidepools, enjoying the open spaces in the wildlife refuge, and soaking in the views can be a real pleasure – especially for those who enjoy some time in solitude. There are also two excellent surfing breaks here during a south swell. Mile markers listed below are those on the Pi’ilani Highway for driving convenience. 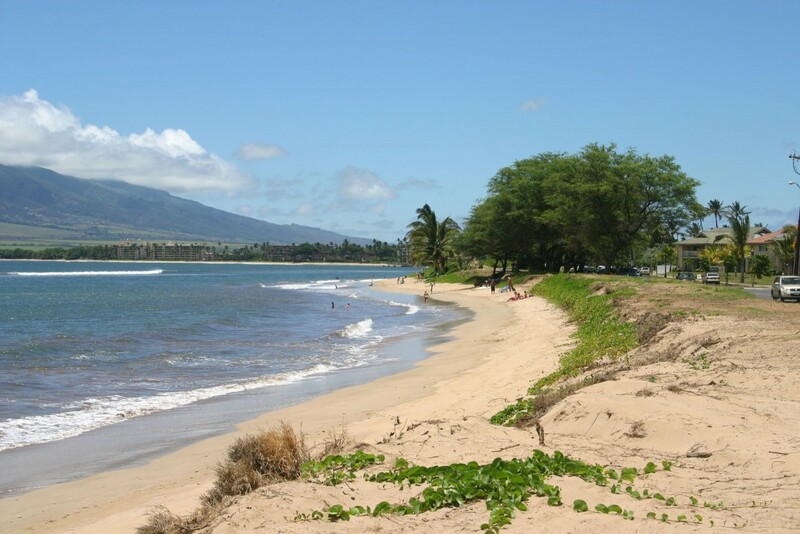 South Kihei Road runs parallel to the highway along the shoreline, all beaches are on South Kihei Road. 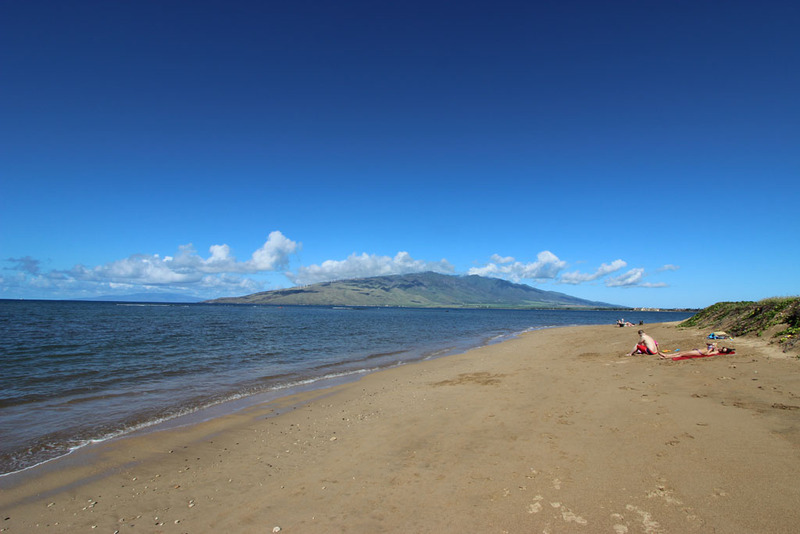 Long sandy beach that runs along the north part of Kihei, the name is said to loosely translate to “not to be forgotten” and is a memorial park “Dedicated to all those who sacrificed their lives to preserve our freedom for all humanity.” Nice beach for long walks or runs. Kite and windsurfing are good here when conditions are right. Facilities: Bathrooms, showers, picnic tables. 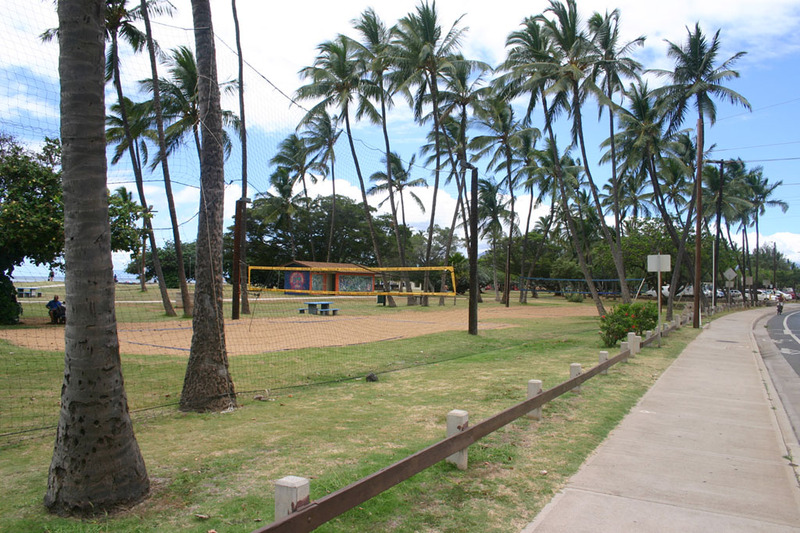 This 1.5 acre County beach park is next to two fishponds of historical significance; the Koʻieʻie Loko Iʻa fish pond (c 1400-1500) fronts the park. The pond fronting the beach is walled in with lava rock, making it a calm place for children to play. This area has much historical significance, as it was once a thriving Hawaiian village and was popular with Hawaiian royalty. Facilities: Port-a-potties, four picnic tables, three BBQs, shower. Waipu’ilani Beach is a long white sand and coral beach protected by reef and suitable for swimming, walks, whale watching, sunsets, etc. There is a beach park here with publicly accessible facilities – though the vast majority of public and visitors think the park is part of the adjacent condos – so it is highly underused. There is an outdoor roller rink that is fun, and free. There is also a skate park here. There is barely any usable beach here and there are vagrants and rougher types that frequent this park and can make hanging out for a BBQ or picnic uncomfortable. Loads of facilities: five sets of bathrooms, many picnic tables, two showers, two pavilions, BBQs, park area, one volleyball court, four tennis courts, four baseball fields, two basketball courts, playground, public outdoor roller rink & skate park. Just at the south point of Kalama Park. Most commonly used for beginner surf lessons, many instructors are set up ready to go every day of the week. There is a hidden cove right next door that is better for swimming and beach (see kayak video below) The park is a go-to for most visitors for surf lessons. Full facilities at Kalama Park immediately adjacent.